These are some Training and Introduction emails that we have produced for various purposes and want to share with you! Our Project Management methods are Simple and Comprehensive focusing on People, Processes and Technology. Collin Quiring presented this webinar for MPUG (Microsoft Project User Group) discussing the compatiblity between the 2003, 2007 and 2010 versions of Microsoft Project and Project Server. From the MPUG description: Collin really nailed down features of the 2010 versions that are not used if the file is opened in either 2007 or the 2003 version. Compatibility is a very important feature to consider, because it might be a determining factor in the cost efficiency of switching to Project and Project Server 2010. Collin began by showing that users should not use the Native mode setting in Project 2010, because that limits the backward compatibility of the project file; it can be used only in Project 2010. It is better to use the Backward Compatibility Mode (BCM); then the project file can be opened in 2010 or older versions. Collin ended by showing how to convert a Project 2010 file back to a Project 2007 file. He then discusses converting Project 2007 files to Project 2010 files, explaining which 2010 features will not be available in the converted 2007 file. This video is strongly recommended to all users of Microsoft Project so compatibility issues will not arise after implementing the program. 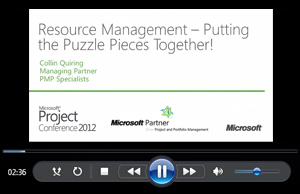 Collin Quiring presented this webinar at the Project Management Conference (PMI). Resource Management is an area of Project Management that is often discounted as a critical part of the process to provide value to customers. Whether your projects are for internal or external customers, the ability to understand your resources and your resource needs are critical. For a Project Manager to obtain the results that they need from their projects there a number of moving parts and pieces about those projects that they need to understand but having awareness about resources is one of the most essential. To understand your resources answers a myriad of questions ranging from “Can we even do this project?” to “When can this project be completed?”. Microsoft Project and Project Server have a number of default settings, calculations and assumptions that can affect how a schedule reacts to the resources. And, the way that the resources are setup, defined, used and assigned can affect that schedule as well. This presentation defines and demonstrates some of the pieces of the puzzle that will allow you to have better knowledge about your resources and how they affect your schedules. 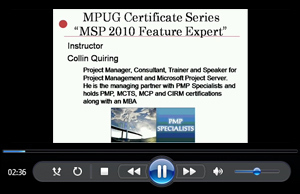 Collin Quiring presented this webinar for MPUG (Microsoft Project User Group) on how to use the Timeline. The Timeline view was a new view that first was used in Project 2010. The Timeline is now used in Project 2013 and Project Online. 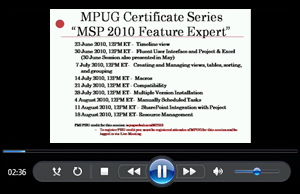 This was part of the MPUG Certificate series that were taught by MPUG expert presenters. 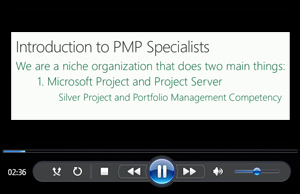 Tim Gryder and Collin Quiring presented this to PMI group in 2014. The Organizational Project Management Maturity Model (OPM3) from the Project Management Institute (PMI) is a globally recognized best-practice standard for assessing and developing capabilities in Portfolio Management, Program Management, and Project Management. It is a wonderful tool and process to help understand where an organization ranks in maturity, capability, understanding and capability in regards to Project, Program and Portfolio Management. This provides an assesment that an organization can use to determine where they should focus future efforts to increase their ability and maturity. The results from the assessment can point to many different areas of the organization that might need some work. many of those involve business processes that can be directly assisted through the use of Project Server. This presentation is an overview of how Project Server accomplishes the implementation of the assessment results of OPM3. Project Server is a powerful tool that can provide the necessary technology and process so that an organization can implement standardization and processes for improved organizational management. OPM3 is a great assessment tool and can show an organization areas for improvement but combining that assessment with Project Server capabilities and technology an organization can quickly realize improvement. Project Server has the abilityto help an organization with all three aspects of the maturity model – Portfolio, Programs and Projects. By tying together the results from the OPM3 Assessment with the functionality of Project Server an organization can quickly realize positive results. Project Server allows an organization to set up Portfolio information with drivers and other analysis tools which helps pick the right Programs and Projects to act upon. And then Project Server allows for the execution, analysis and reporting of the work in the chosen Projects and Programs. Part of the OPM3 Assessment is about the documentation from the business process perspective. This is about having the appropriate documentation that corresponds with a Projec or Program. Project Server is linked tightly with SharePoint Server which allows for the documentation, issues and risks to be maintained. With the integration of SharePoint and Project Server an organization can be more effective and can become more mature in their organizational abilities. We believe that combining the capabilities of Project Server and SharePoint Server with the OPM3 assessment results is a natural fit of technology and process. This presentation is an overview of how Project Server accomplishes the implementation of the assessment results of OPM3.